Mobile recharge gets easy plus you get to save a lot on it if only you are using Paytm online recharge services. Now you can recharge your mobile on the go without any payment issues because Paytm wallet is always there to help you. So no more depending on physical recharge stores or your mobile network stores to get your recharge done. And Paytm also brings to you super heavy cashbacks that makes it look like that you just made a free recharge for yourself. So get on this site now and start using the recharge promo codes present to save on your every penny. Paytm Recharge brings flat Rs 15 cashback on recharge of Rs 399 to your Jio number. Recharge here and get additional offers like Rs 150 cashback on movie tickets, Rs 750 cashback on flights etc. Recharge today. Paytm Recharge offer is here! Paytm Recharge is offering flat Rs 10 cashback on recharge. Minimum recharge value should be Rs 200. Valid for all users and 3 times per user. This coupon code is applicable on mobile prepaid recharge only. Recharge now. Paytm Recharge brings this chance to win Yamaha Fascino and movie tickets. Top 3 spenders will be awarded Yamaha Fascino and next 100 top spenders will get Movie Vouchers at the end of offer Period. Make use of maximum number of services that Paytm has to offer - DTH, Prepaid Recharge, Mobile Postpaid Bill, Datacard and Landline. Only the successful transactions will be considered for this offer. To increase the chances of winning, user can do as much value of recharge/bill payment as possible using this coupon code. Paytm Recharge is giving upto Rs 10 cashback on recharge and bill payments. Promo code is valid on prepaid, postpaid, dth, data card recharge, landline transactions. Maximum cashback is Rs 10 and minimum assured cashback is Rs 1. Promo code is not valid on Airtel services and can be used up to 5 times per user per number. Recharge today. Paytm Recharge is giving FREE movie ticket on bill payments. Promo code is valid on Electricity, Financial Services, Metro, Gas, Tolls, Water & Education transactions of Rs 100 or more. Promocode can be used 2 times per user and once per Number. Use code MOVIEBILL to book your free movie ticket after 24 hours of successful transaction. Get it now. Paytm Recharge is offering 100% cashback on movie tickets, when you make electricity bill payment using this coupon code. All the consumers who have made their TPDDL, BSES Rajdhani and BSES Yamuna electricity bill payments of Rs 100 or more on Paytm are eligible to participate in this campaign. Consumers are required to apply Promocode 'FILMYBILL' on bill payment of Electricity Bill to get movie vouchers worth Rs 300. This promocode can be used only once per user and once per Number. Use movie voucher 'MOFFER300' to get 100% Cashback upto Rs 300 on booking 4 or more movie tickets. This code will be activated after 24 hours of successful bill payment using code FILMYBILL. Pay now. Paytm Recharge is offering flat Rs 125 cashback on purchase of LED bulbs. Use this promo code while paying electricity bill and get an exclusive code to get Rs 125 cashback on purchase of LED bulbs at Paytm. Valid 2 times per user. Pay now. 1. Do electricity bill payment at Paytm Recharge by using this Paytm Recharge promo code. 2. Every hour, one lucky customer will get 100% cashback. 3. Coupon can be used once per number. 4. Coupon code can be used 3 times per user. With Paytm Recharge, make a DTH recharge by applying this promo code to get a chance to win a Full HD LED TV. The recharge value must be Rs 50 to be considered for this lucky draw. Do more DTH recharges with Paytm Recharge and get more chance to win 40 inch Full HD LED TV. Win now. With Paytm Recharge, make recharge/bill payment using this promo code to get a chance to win 1 lakh every week. This 1 lakh will awarded in the form of Paytm cashback. Do more recharges ad get more chance to win. Winners will be notified through email/SMS within 48 hours daily basis. Recharge today. Paytm Recharge is giving FREE movie ticket on Metro card recharge. Promo code is valid on Electricity, Financial Services, Metro, Gas, Tolls, Water & Education transactions of Rs 100 or more. Promocode can be used 2 times per user and once per Number. Use code MOVIEBILL to book your free movie ticket after 24 hours of successful transaction. Get it now. Paytm Recharge is offering flat Rs 50 cashback on prepaid electricity recharge. Get flat Rs 50 cashback on minimum transaction of Rs 1000 or more. Promo code can be used only once per CA/Flat number. Promo code can be used 1 time per user. Recharge now. Get 100% cashback on Delhi metro card recharge every hour. This coupons valid on online metro card recharge & Delhi users only. Promo code can only be used once per card number. Promo code can be used 3 times per user. Click to use this coupon code and get the discount. Verified on 23/4/2019 .. Paytm Recharge is offering a chance to win free recharge for a year. Use this coupon code while doing bill payment of Rs 100 and above to get eligible for lucky draw. 51 top spenders will get a code to get free recharge of Rs 200 per month. This code will be valid once per month till 12 months. This coupon code is valid on mobile, data card and landline, electricity and water bill payments. Pay now. Book e-train tickets at paytm and get a movie voucher worth Rs 150 for free. Apply coupon code at check out page to get the offer. Book IRCTC Train Tickets Through Paytm and get avail offers on hotel bookings. No coupon code is required. Paytm Recharge is giving 100% cashback on electricity bill payments. Maximum cashback available is Rs 1000 by applying this promo code. Promo code can be used once per CA number. Discount code is applicable only on Gas Bill Payment. Promo code can be used 3 times per user. Pay your bill now. Paytm Recharge is offering best deals on mobile recharge and bill payments. Recharge here and get 1% cashback upto Rs 300 on your next recharge and bill payments. Check the landing page for more information regarding this offer. Verified on 23/4/2019 .. Paytm is giving upto Rs 10 cashback offer. Promo code GRAB10 is valid on all mobile prepaid, mobile postpaid, dth, data card recharge, landline transactions. Maximum cashback is Rs 10 and minimum assured cashback is Rs 1. Promo code is not valid on Airtel services and can be used upto 5 times per user per number. Avail today. Paytm Recharge portal brings flat Rs 50 cashback on Spectra broadband bill payment of ?500 or more. Minimum transaction amount must be greater than or equal to Rs 500. Maximum Cashback amount that can be earned is Rs 50. Promocode can be used only once per user and once per number. Promocode is valid only for Spectra Broadband users. Pay now. Paytm Recharge is offering flat Rs 50 cashback on prepaid electricity recharge. Get flat Rs 50 cashback on minimum transaction of Rs 1000 or more. Promo code 'POWER' can be used only once per CA/Flat number. Promo code can be used 3 times per user. Recharge now. Paytm Recharge is bringing this exciting offer for all its users. Pay electricity bill at Paytm and get a chance to win Iphone 6S. To avail this offer please follow the instructions given in the landing page. Pay today. Paytm Recharge is giving best deals & discounts on recharge, DTH, mobile prepaid recharge, electricity bill, mobile postpaid bill, water bill, datacard and landline, mobile internet recharge of 2G, 3G, 4G of all networks. We can recharge our prepaid mobile for all networks like Airtel, Aircel, Idea, Vodafone, BSNL, Uninor, Tata Docomo etc. Click to grab more online Paytm Recharge add money offers for new/existing users and get 50% - 100% cashback on every recharge. Save money on every recharge with Paytm. Paytm presenting massive offer for new & old users. Get Airtel recharge plans at discounts at Paytm. Make mobile recharge for Airtel & Reliance with just few clicks at Paytm online portal. Get fast, easy and secure recharge using detailed recharge plans whenever while going, at home or in the workplace through your portable device or desktop. Recharge with HappySale Paytm mobile recharge, to get best deals/offers. click to grab Paytm offers for reliance postpaid bill payment and for Airtel also. Paytm online recharge brings you easy Idea & Vodafone prepaid and post paid recharge online that is fast and secure. You can now recharge Idea & vodafone online in less than a minute. Recharge here and you can pick different deals and discount offers and they could be even double the value of your recharge or even more. Recharge online your Idea & Vodafone number here and get best discounts now. Click to grab Paytm promo codes for Idea & Vodafone prepaid & post paid mobile. Recharge today. Recharge with Paytm and get best cashbacks on data card recharge & bill payments with upto 100% cashback. You can get cashback on all services like BSNL, reliance, MTNL, Tata photon +, Tata photan whiz, MTS MBlaze recharge, MTS Mbrowse, Airtel, Aircel, Vodafone recharge and on data card bill payments also. Click to grab more Paytm cashback and recharge offers. With Paytm Recharge, you get the comfort of recharging, choosing the suitable Vodafone recharge offer. You can choose the plans according to your usage. Those who have long night calls can use Vodafone night pack. And the ones who want to keep their conversation the text way can use SMS packs. Use Vodafone tariff plans to avail special offers and benefit yourself. Every recharge done through Paytm, gives you added benefit of cashback and great deals. Paytm is offering upto 100% cashback on electricity & landline bill payments of all services like Reliance Energy, BSES yamuna, TSSPDCL, BSES Rajdhani, CESC limited, NOIDA power company, North bihar power, SNDL nagapur, Torrent power, Tata power DDL, Uttar pradesh power corporation, Jaipur vidyut vitran nigam electricity bill payment, Muzaffarpur vidyut vitran electricity bill payment etc. Click to grab more Paytm offers from landing page. Paytm brings to you the easiest way for BSNL & Airtel online mobile recharge. For BSNL & Airtel, log on to Paytm.com, enter your prepaid mobile number, select your current operator, enter the amount and enjoy uninterrupted service. You need not visit the nearest retailer to get promo codes to recharge. With easy BSNL & Airtel recharge online, you can recharge for top ups, free minutes, 2G data, 3G data, 4G data internet, full talk time and even for special recharges. Recharge today. Verified on 23/4/2019 .. Paytm IRCTC Offer: Book IRCTC train tickets through Paytm and get a movie voucher worth Rs 150 for free. Apply coupon code TMOVIES at check out page to get 150 OFF on train tickets. Please use promo code MOVIETRAIN after 24 hrs of successful bookings to get Rs.150 Cashback on movie tickets. Check more details & terms while applying promo code during your train ticket booking. Paytm is Offering 5% Cashback on Recharges and Bill Payments of Rs 20 and above for TATA Users. Get Maximum Cashback of Rs 200. This Offer can be used Upto 5 times per User/Number. Recharge Now. Paytm is Offering 5% Cashback on Recharges and Bill Payments of Rs 20 and above for MTNL(Mahanagar Telephone Nigam Limited) Users. Get Maximum Cashback of Rs 200. This above Coupon can be Used Upto 5 times per User/Number. Coupon will only be applicable on 2nd recharge of the day. Recharge Now. Paytm presenting 5% Cashback on recharges of prepaid and post paid recharge and bill payments of Rs 20 and above for Vodafone users. Get maximum cashback of Rs 200. This above code can be Used Upto 5 times per user/number. Valid on Sunday only. Recharge with HappySale Paytm coupons for recharge and save your money. click to grab Paytm Vodafone postpaid & prepaid bill payment coupons and discount coupons. Paytm provides 4% money back on recharge and bill payments. Valid for BSNL users only. Get maximum money back of Rs 200. Use this coupon to get 4% cashback. Cashback will be credited to your Paytm wallet. This coupon can be used upto 5 times per user/number. Recharge now. Click to grab more Paytm promo codes for BSNL prepaid recharge. Paytm come up with exclusive Paytm Recharge promo codes for Aircel users. Get 4% cashback on recharge and bill payments for Aircel users. Get maximum cashback of Rs 200. This coupon code can be used upto 5 times/user/number for old user and new user. Recharge now. Paytm offers Rs 50 cashback on DTH recharge of Rs 300 and above. Code (DTHNEW) can be used one time per user. Valid for New users only. This is not valid on Airtel DTH Recharge. Valid on Web and App. Recharge now. click to grab more Paytm offers. You can save and recharge together ! Paytm is one of biggest recharge sites in India that delivers instant online prepaid recharge and mobile bill payment solutions to its customers. It ensures 24x7 availability at no extra cost so that a user can transact securely anytime and from any location at their convenience. You can get up to 100% cashback even if you recharge for Rs.5, sounds amazing right? You can avail such offers and more on Paytm. Are you running out of balance? Don’t worry. With Paytm mobile app, you can enjoy instant recharges and bill payment services even when you are on the go. Paytm is available on Android, iOS, Windows, Blackberry and Android One platforms. Download and install the Paytm App and recharge anytime, anywhere without any hassle. Your Paytm experience will make you forget all other means of recharge and stick to the routine of Paytm recharges. You can simply pay with Paytm. Paytm recharge offer codes easy and quick prepaid recharge for all network providers in India including BSNL, Airtel, Idea, Vodafone, Reliance, Tata, MTNL, MTS, Aircel, Tata Docomo and more. Not just that, you can also pay postpaid bills and utility bills like electricity, gas, landline, DTH recharge, metro & data card recharge and more. Add money in your Paytm Wallet and pay via your wallet to avail great discounts, cashback on recharges and other payments. There are many deals and offers which you can avail while using Paytm. The best deals which help you save and at the same time pay as well. You can recharge with amazing deals like the BSNL Monday offers, MTS Tuesday offers, Tata Friday offers and Aircel Saturday offers. You can use the promo codes around 7 times a day. Promo codes can also me used only 2 times per year. It is valid on both web and app. You can also recharge the DTH through Paytm. The offers available are Dish TV Monday offers, Videocon Tuesday offers , reliance digital TV Wednesday offer, sun direct Thursday offer and Tata Sky Friday offer. The promo codes for this can be used five times a day. Promo codes can be used only once for one subscriber’s id. Its works on the app and the webpage. The offers would be valid only for a limited period of time. The other recharge options available are data card recharges of BSNL, Tata photon, Tata photon wizcard , Mbrowse, MTNL, vodafone and Aircel recharge. You can get so many cashback offers while recharging through Paytm, be it for any company. It would be a win win deal for you. Cashback will be credited within 24 hours of the transaction into the user’s Paytm user account. You can refer to the site for further information on this as the company maintains certain do’s and dont’s regarding its products. 1.APEPDCL- Eastern Power Distribution Company of A.P. Ltd. 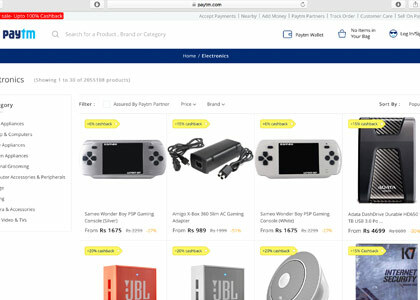 When you want to opt in for the best of the Paytm coupons that are authentic, latest and offer the best discounts, browsing and booking it from HappySale is the best option. All you need to do is read through the deals and discounts and activate the same prior to the expiry date.